A hand-painted model of Baryonyx by Papo. 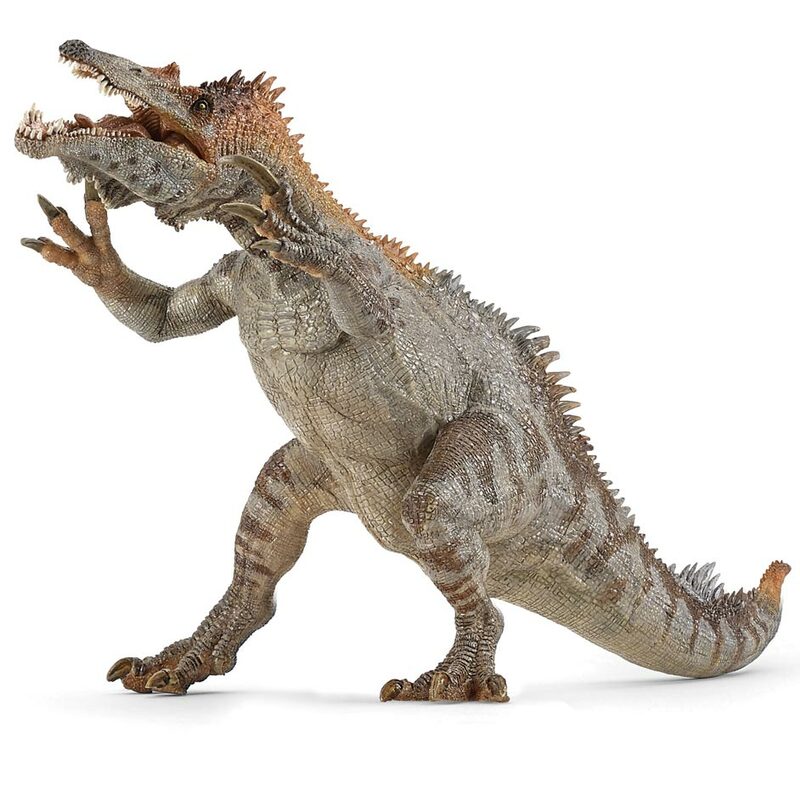 A Papo Baryonyx dinosaur model complete with an articulated lower jaw. Great for creative, imaginative play. Length 33 cm approx. Height of head 16.5 cm approx. An awesome take on the Baryonyx! A lot of other models out there are either dated or just look like Spinosaurus without the sail, but this model really feels like a proper Baryonyx. The spines and the tripod-ish pose (can balance on two legs) may not be to everyone’s taste but I personally don’t mind them. The articulation of the jaw is also pretty nice, it can open incredibly wide. One thing I’ve heard a lot of people talk about with this model is that it’s very shiny, which was certainly not the case with my figure. Also, this figure is incredibly strong. I had temporarily stored it on a high shelf which my cat managed to push it off of and the model was unscathed. So if anyone is buying this for a child, it is more than capable of surviving some rough play. And, as per usual, cheap prices and speedy shipping from EverythingDinosaur! vibrant colors on the back with thorns. teeth and jaws do very detailed. Hand picking up a very solid and heavy, in terms of every aspect I’m very happy about it. Thanks Everything Dinosaur. Since this model was first advertised I was in two minds about getting this one. There are very few images on the net and those available give the appearance of a pot-bellied tripod figure. However since purchasing I realise the images don’t actually do the sculpt any justice. It’s certainly stylised to an extent but the potbelly isn’t there and he stands quite comfortable on two feet. There’s lots of detail and texture. The one element I felt was lacking for Papo was the paint. Most of the natural vynil was left unpainted forming the overall base colour, which gave it that shiny plastic look. The actual paint didn’t relate to the body and textures, which looked unnatural and made it a little disappointing. However after I repainted mine he looks magnificent. If you are into repainting models this is great one to do. Overall this is a dramatic, sizeable model and I am happy I decided to purchase one and it’s great to see a British theropod in Papo’s line. This is a depiction of Baryonyx plus inspiration from other spinosaurids, and succeeds in being one of the most dramatic model dinosaurs I’ve ever seen! The model is posed as though lunging for a leaping fish in a pose that is clearly inspired by modern grizzly bears. It is not designed as a pop-fiction monster, it is very much inspired by a broad variety of extant animals, with artistic influences from the works of Robert Bakker, Greg Paul and Todd Marshall. The result is very striking indeed! Some of these models apparently stand in a tripod pose, but luckily mine stands with the tail a clear 2 cm off the ground at the lowest point, like the original prototype, making it all the more dynamic! Papo have chosen not to add any fuzz, however, it does have a keratinous dewlap and crest running from the head to the spine. The level of detail is breathtaking, and very fine, especially on the very crocodilian head and the soles of the feet. Papo are very hard to equal in terms of detail and this figure will take some beating. It is almost incomparable to their own JP inspired Spinosaurus, it is so vastly superior. The colour choices and patterning seem a little eccentric, but the paint is flawless and multi-layered. The overall finish is glossy, but strangely matt in the mouth, especially the exquisitely detailed tongue! Great care has been taken to make the seams as subtle as possible as this has been very successfully achieved. Although the model may not be entirely “accurate” as a Baryonyx, it is very lively and powerful, and an excellent tribute to spinosaurids. You can almost feel the spray from the fast flowing river in which this beast hunts! 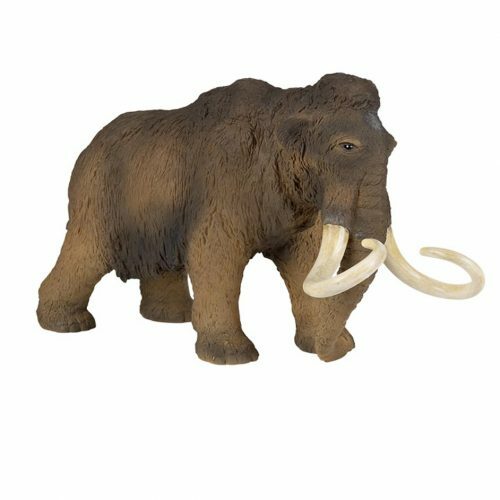 The fact that Papo can produce a model of this size, quality and weight, that can balance perfectly on one and a half feet without making these oversized, is great testimony to their sculptor! The production values are truly astonishing, as is the final result. This figure has truly exceeded my expectations! Outstanding, as are the whole team at Everything Dinosaur. Many thanks to you all! A truly amazing dinosaur by Papo. It is huge and amazingly detailed. Fantastic customer service from Everything Dinosaur as always: prompt and courteous communication, everything is quickly packed and posted, the added fact sheet is a great touch especially for a dino-mad little boy who loves his facts and figures.